For those who followed their trail through the years, AHKMED is Australia’s heavy psychedelic rock royalty. Formed in Melbourne in 1998, the quartet of two guitars, bass, and drums started from fuzzy riff-rock and developed their sound more and more, tripping through the debris of space-rock and the obscurity of experimental rock-orchestration. They developed into tree-piece – Popey (drums & voice), Carlo (guitars), and Dan (bass) – favoring lengthy, deliberate, mostly instrumental sound explorations filled with all the hallmarks of modern-day psyche-experimental-rock: droning guitars, distortions, grooves, washes of white noise, riff-trappings, etc. As their musicianship improved, the trio gradually distanced from traditional influences, but maintained their affinity for classic power-rock music. All their EP’s were self-produced short-runs. Please be sure to visit AHKMED page at MyspaceMusic. In 2009, the band signed a deal with German label Elektrohasch Records. "Chicxulub is an ideal way to get in touch with this yet rather unknown heavy fuzz psychedelic post stoner rock band. 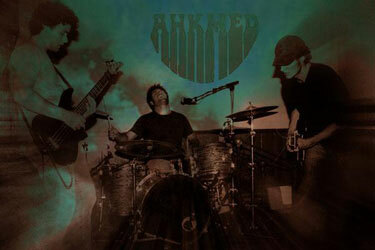 Expect more sun-drenched desert rock from Ahkmed in the future. (Grade: 8/10)" – by Pascal Thiel at DisAgreement (Luxembourg) (December 2007). "Imagine Hawkwind, in their cosmic, amphetamine-driven prime, joining forces with Isis, and you have a nearly dead-on description of their sound... The fresh interpretation of a sound that some would already considered played-out makes Chicxulub worth it for any fan of heavy music." – by Andy O'Connor of Sonic Frontiers (USA) (January 2008). "Ahkmed start to mix things up pretty quick, cranking up the space rock, the fuzzbomb guitars kicking out utterly wicked Sabbathian stoner riffs, and then everything suddenly surging forward into a sick Krautrock style jam, acid guitar freaking out over propulsive amphetimine fueled drumming that cuts a swath across red desert wastelands, a burly soulful drawl comin' out of nowhere and describing mystical vistas, then stumbling back into muted druggy psychedelia, soaring cosmic drones and lengthy passages of spaced out ambience. The loud/soft, stomp-on-the-distortion dynamics are used to great effect on alot of these songs, but it's the massive crushing Krautrock rhythms and super zonked, fx-splattered guitar that wanders all over the horizon of Chicxulub that makes my eyes roll back into my head. Very crucial heavy psych - imagine Hawkwind, Finnish hypno-metallers Circle, the more recent Isis stuff, Acid Mothers Temple, Pink Floyd, Kyuss, and Monster Magnet rolled into one big fat bong blast of psychedelic stoner post-rock... Highly recommended to fans of heavy psychedelia. This album rules." – by Adam Wright at Crucial Blast (USA) (May 2008). The album was also reviewed at: StonerRock.com (USA), Nota-Bena (Russia), Aural Innovations (USA), Leicester Bangs (UK), Psychotropic Zone (Finland), The Silent Ballet (USA), Deaf Sparrow (USA), Maelstrom (USA), Rocktimes (Germany).